Sea of Thieves is an open-world exploration game from Rare, in which players assume the role of a pirate trying to earn a fortune. Three years since the first announcement and numerous alpha and beta tests, Rare has delivered a unique roleplaying experience unlike any other. The real test will be how long they can keep players entertained. From the moment you enter the game, you are transported into a whole other world. The title screen sees you in a tavern, with a sea shanty being played in the background on a concertina, and the menu wastes little time getting you started. First, you pick your pirate. Designing your pirate from the ground up is not an option; no customization sliders to be found anywhere here. Instead, you are given the choice of eight random pirates varying in age, gender, and shape. If you’re unhappy with those, you can randomly generate eight more, with the option to hold onto the models you like most. Eventually you’ll have to pick one, if only to access the game itself. If you change your mind halfway through and want to change your character, you’ll have to delete him or her, erasing all your progress. Your next choice is to decide whether to sail alone or in a group, and whether you want a large three- or four-man galleon or a smaller sloop. Both ships are fun and unique in terms of gameplay and stats, and you can select which one you want to use as you start each session. The sloop is easier to manage, since it’s made for one or two players, but the galleon requires more vigilance in sailing and combat, making it a more attractive “true pirate” experience. Once crew and ship are finalized, you’ll enter the game’s vast world, a large ocean dotted with islands of many shapes and sizes. Sea of Thieves does very little to walk you through the game. Instead, you wake up from a drunken stupor in a tavern, with a cryptic map and a banana to guide you, and a few basic tutorials to teach you how to select tools or weapons from your radial menu. After that, you are left to wander and discover the various shops, factions, and supplies on your own. Only when you try to show your map to another player (if there is one in your play session) will you trigger an additional line of helpful text indicating the need to visit a faction for missions. Since the ability to show your map to other players isn’t explicitly communicated, you may find yourself at a loss for a while. It’s best to find a friend to guide you through your first hours of the game, or at least a friendly stranger, which the game’s matchmaking can do for you. Each faction tasks you with a unique mission type. The Gold Hoarders will give you maps or riddles to find buried treasure, the Order of Souls seeks the skulls of pirate skeletons - gathered by defeating captains in combat - and the Merchant Alliance requires the delivery of animals or goods. Initially, you will find your goals nearby, requiring limited sailing, but as you turn in rewards and increase in rank within the factions, the complexity increases dramatically. As an example, my first voyages were short trips to and from another nearby island, but at around rank 25 - halfway to the max of 50 - a single mission took my crew to three islands spread across the map. Unfortunately, because of the randomly-generated loot, an hour-long trek is occasionally rewarded with only a few hundred gold. Conversely, sometimes short easy missions reward players with loot worth a thousand or more gold. Although it’s nice when RNG favors you, some kind of relationship between reward and time invested would be appreciated. Another source of annoyance is the Order of Souls’ missions, which require you to sail to a given island to find a crew of skeletons and defeat their captain. These missions naturally focus on combat, which features swords and guns primarily, though you have your choice of pistols, shotguns, and sniper rifles. Gunslinging is hard with limited ammo capacity, and requires frequent resupplying. The swordplay is more frequent, but leaves something to be desired. There are only two combos and a block, which work well enough when they connect, but the fighting seems poorly tuned, with some attacks missing for seemingly no reason. In the heat of battle, you may need to heal or switch weapons, but exchanging your sword for another item doesn’t always work correctly. This leads to a few errant swings when you may have intended to eat a banana or fire at an enemy. Furthermore, some islands are currently bugged, with skeleton crews seemingly refusing to spawn; this requires either revisiting the island to trigger their spawn, or else quitting the mission altogether. Problems like this can kill enthusiasm when encountered after a long voyage. The core of Sea of Thieves’ gameplay revolves around completing faction missions, but a great deal more fun can found on the high seas. Playing sea shanties, getting drunk and falling off the boat, and climbing up to the crow’s nest to watch for hazards are just a few things you can do when you aren’t manning the sails or steering the ship. Don’t worry; a handy mer-person will help you if you are lost at sea without a boat, so being knocked off your ship is only a minor inconvenience. When someone starts playing a song, you or other players nearby can join in, which goes a surprisingly long way in breaking the ice with strangers. That’s not to say that every player you meet will be friendly, and herein lies one of the biggest problems with the game. Over my many, many hours with Sea of Thieves, my friends and I, and occasionally some strangers, have both found and created our own fun. Playing our instruments while drunk, or mistakenly running our ship into shallow waters due to miscommunication proved to be as entertaining as any given mission. It is rare, however, that my ship is the only one on the ocean, and when two ships are near each other - whether by chance or not - everyone is on high alert. Both crews wonder whether or not the other is going to attack, and if someone makes a wrong move, it can be misinterpreted as an act of aggression, sparking a pre-emptive cannon shot that in turn starts a long and bloody battle. This, on its own, is not a bad thing. It can be fun when your ship limps away victoriously while the other sinks into the watery abyss. The problem lies with players who use the pirate setting as an excuse for toxicity. Attacking another player for their loot is a fair game - it’s expected of a “pirate” - and you should always remain vigilant when you’re transporting a small fortune. That’s not the issue at hand. The cruelty of more toxic players starts to show when they repeatedly sink one-man sloops for no gain. Likewise, throwing a random fourth player into the brig because they want the fourth to leave also ruins the fun for innocent solo players. Toxicity is to be expected in any online game, but some people are taking the Thieves part of the title as an excuse for childish behavior. 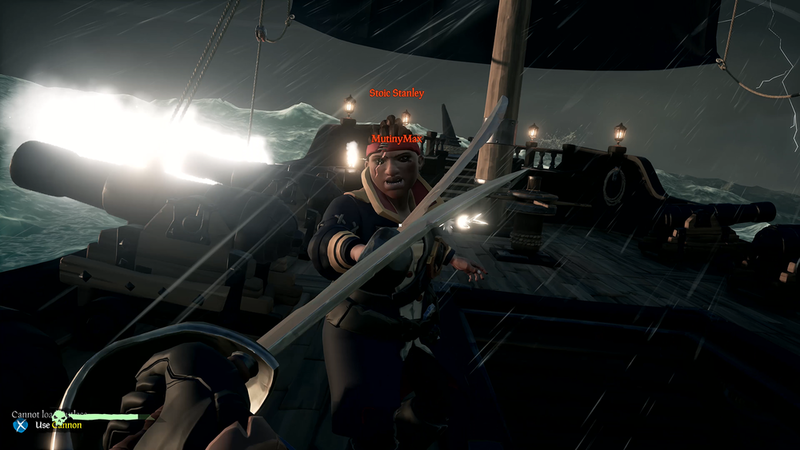 Rare has taken note of these issues; repeatedly destroyed ships will spawn out of cannon’s reach, and the studio is working on a solution for brig exploitation, but for now players are at the whim of less compassionate pirates. Player-generated frustration aside, one of the most fun and intense activities consists of attacking active skeleton forts. When a large skull cloud appears above a fort, everyone in the server can see it, and will likely make a beeline for it, because defeating the 12 or so waves of skeletons rewards players with loot worth over ten thousand gold. 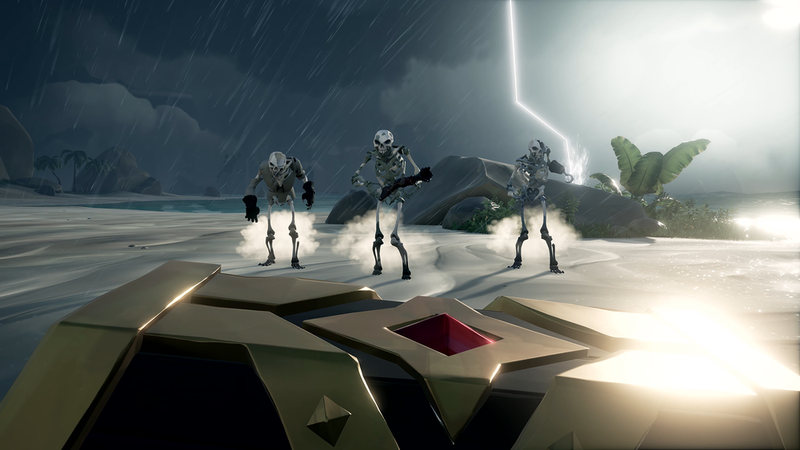 This activity is the pinnacle of Sea of Thieves so far; players have to adapt to defeat various types of skeletons (gold plated skeletons require water to rust their armor, while shadow skeletons require light to make them vulnerable) while keeping an eye on the horizon for other players coming to steal their booty. The high rewards means the fort is a hotbed of player activity while active, which more often than not results in tragedy, but resourceful players can deftly wipe the fort clean of skeletons to take home the treasures within. Sea of Thieves is a game about rising through the ranks of three factions to become a pirate legend, earning literal boatloads of gold in the process. While it’s nice to bring home so much gold, the sad conclusion is that there is not enough to spend it on. Exorbitantly-priced paint jobs, sails, and figureheads require you to have quite a bit of gold saved up if you want to customize your ship, but there are only a few different options of each. Similarly, if you want to customize your character, you can equip hooks or peglegs, new hair or facial hair, and cosmetic variants of your clothes and tools, but after a few purchases there doesn’t seem to be a point since you rarely ever see your own avatar. The pegleg or hook can be heard and seen during certain activities, but nothing you buy changes your gameplay beyond cosmetically. Speaking of cosmetics, Sea of Thieves has created a beautiful world full of fantastic islands and majestic sunsets. Pirates and skeletons appear cartoonish, with exaggerated features, but the rest of the world looks more realistic. Islands and outposts appear as if they were taken straight from real world settings, and the variety in their shapes and layouts makes learning each island a triumph. The ships look similar to one you’d expect to see in a pirate movie, and the carefully crafted details throughout the rooms and decks bring the settings to life. The ocean is as varied as the islands scattered throughout, ranging from violently stormy to immaculately calm. The complexity and beauty of the artwork is sure to be appreciated for years to come. As limited as the customization can be, the options are substantial compared to the missions available. Each faction has one or two mission types, with only minor differences (if any exist). Fighting a skeleton crew on their own ship would be exciting for players that dread player vs player combat, and would provide them with practice to defeat more seasoned players. Several islands also feature crude paintings of mythical creatures, like giant crabs, which would also make for thrilling combat encounters. As it stands, Rare will have to add more content soon if they hope to keep players engaged beyond the first month, especially considering Sea of Thieves is available on the Xbox Game Pass. Without new, interesting content, many players are likely to drop their subscriptions. The 60 USD price tag seems a bit steep, but buyers are likely hoping for the promise of a grand adventure full of updates and live events. For the time being though, Sea of Thieves just doesn’t have enough content to justify the retail price. With the Xbox Game Pass offering Sea of Thieves for 10 USD, this currently seems like the more sensible option, though Microsoft or Rare may eventually remove the title from their service. That said, however, Sea of Thieves was thoroughly enjoyable throughout the many hours I’ve played it, and though playing alone on a sloop can be tranquil and almost meditative, it’s more likely that playing with friends is the reason why it’s so much fun. At the end of a long day, there’s nothing quite like joining a few friends and sailing into the horizon for new adventures. [Update: 6/15/18] At the time of this writing, Sea of Thieves has received two major content updates. The first, called The Hungering Deep, introduced a bard named Merrick who bears scars from an encounter with a mysterious beast. Through a series of clues and voyages, players were meant to piece together the story of Merrick’s injuries, eventually culminating in a battle with a massive four-eyed shark. While exciting, summoning the beast required cooperation between at least two crews which wasn’t always feasible. As mentioned in my original review, players are often outright hostile, and even with the incentive to work together, I found myself looking for a long time to finally summon the megalodon. The fight itself was intense and exciting, much like Sea of Thieves was in its first weeks, and my reward was a unique cosmetic for my ship. Suddenly though, after two weeks, the event was gone, and replaced with a scavenger hunt of sorts. Initially I was annoyed and confused; I knew the event would only be active for a limited time, but in a world with other responsibilities, two weeks seemed like no time at all. Three of my usual crew (myself included) were able to complete the event, but it feels unfair that our fourth just couldn’t get an hour or two in to finish it himself. Luckily, Rare has promised other similar events, so we’ll have a better idea of our window of opportunity. As for the second update, players are now required to find ten skeleton thrones scattered amongst the numerous islands, with only vague hints to guide them. A friend and I were able to suss out the locations of most of them, but once again Sea of Thieves attempts to foster cooperation between players. Sitting upon five of the ten thrones is enough to earn credit, but the other five require two players from two different crews to activate them. Again, players are hesitantly agreeing to cooperate, but these uneasy alliances seem too fragile. A single errant sword swing or gunshot could topple the joint effort, wasting the time required to find, reach and activate the thrones. The reward for this event comes in the form of Doubloons, which can be used to buy three new clothing items, gold, or even reputation for one of the three central factions. Since this currency appears to be severely limited - you can earn 100 for activating all ten thrones - the essential buys are the clothing, as gold and reputation can be earned over time anyway. It’s currently unknown if players will have other opportunities to earn Doubloons, but it can be assumed that future events will allow for it, albeit with different cosmetics to purchase with them. The Hungering Deep is a great start for the additional content promised, and the cosmetic items look cool, but it remains to be seen whether Rare will continue to keep the game interesting with future updates. With Cursed Sails coming in July and Forsaken Shores dropping in September, time will tell.